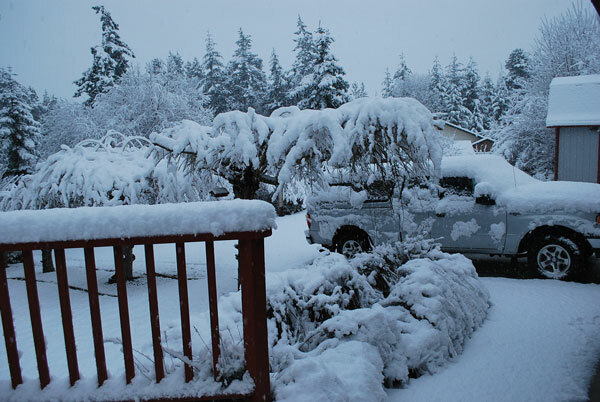 I guess it's only fair that we finally get our share of the snow that's been sweeping the country. While certainly mild by East Coast standards, this was pretty extreme for us and we have been staying home. Overall, we got about 10 inches total. 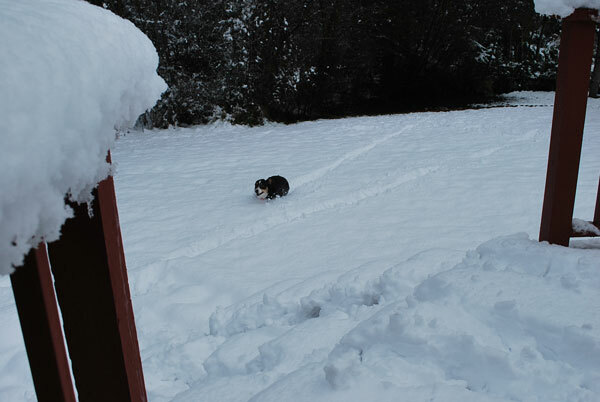 Usually when we get snow, it melts quickly, but it is down near freezing, so this will probably stay with us for few days. This has been the perfect excuse (as if I needed one) to stay in and sew. I'm really feeling the love for finishing projects and completed my Mexican Star quilt yesterday. 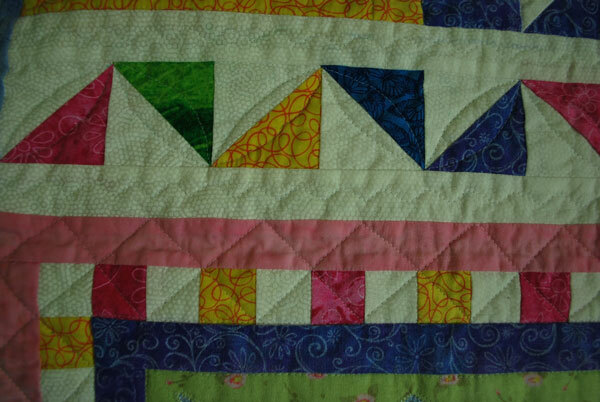 I actually did some free motion quilting in the plain squares and it didn't come out too badly at all. 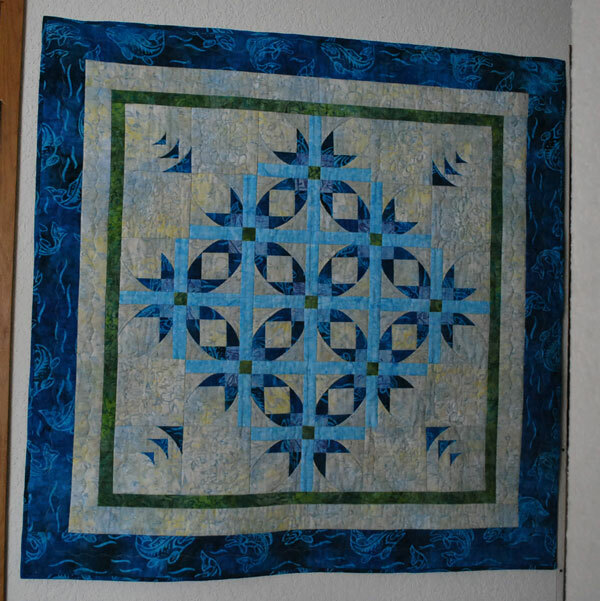 I'm still not excited about showcasing it on plain fabric, but will probably continue to practice on any quilt that has areas of printed fabric. 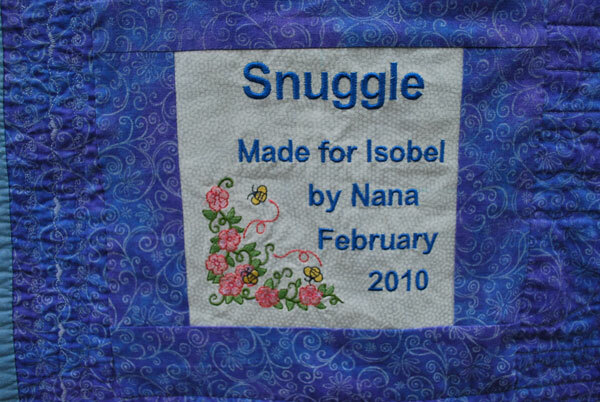 Before the great snowfall, we did manage to get down to Snohomish to deliver the girls' quilts. 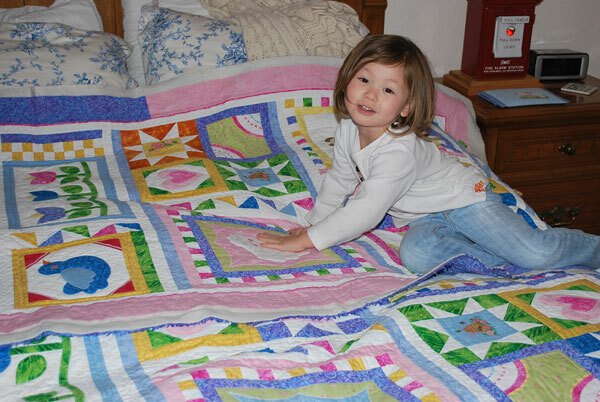 Mei-Mei was thrilled with hers and kept telling me "Thank you for my quilt Nana!" Isobel – well, not so much. 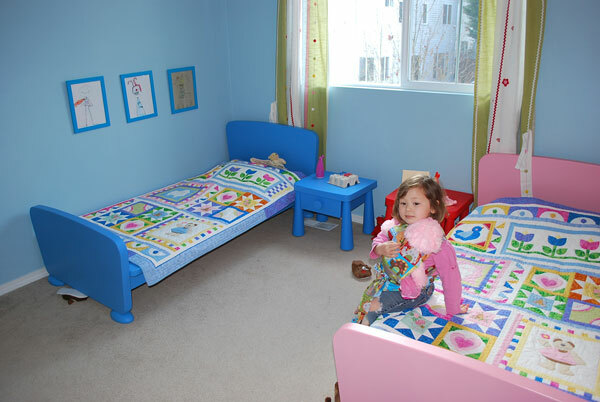 We laid out the quilts on their beds and she very politely informed me that she only liked one blanket on her bed. Obviously the quilt was not the chosen one and she very gently folded it up and put it away! Later I asked her if she was going to snuggle under her quilt and she said, "When I want to." Obviously she has a mind of her own and will do things on her own schedule! 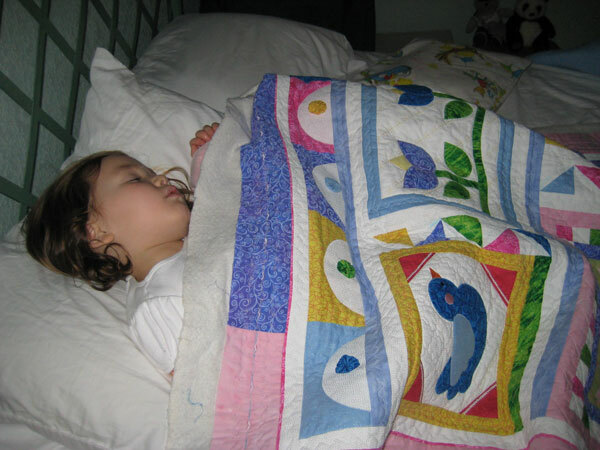 I did manage to get some pictures of the quilts on the beds, along with at least one delighted granddaughter. 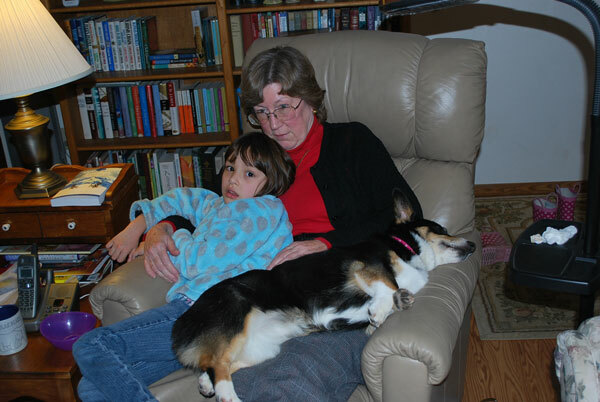 As usual, I brought my knitting with me and at one point in the day was knitting with Isobel snuggled next to me. I asked her if she would like to learn to knit. 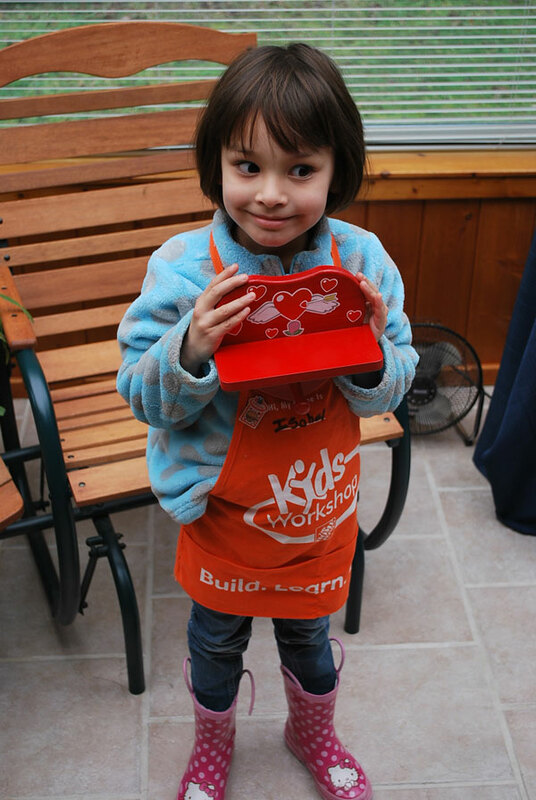 She said, "No, I want to be a scientist." I told her she could do both, that there were a lot of knitting scientists. Her reply – "Knitting is for old grannies. You're old, right? But you can still walk." A few minutes later a little neighbor boy who was visiting came up and watched me and asked what I was doing. I explained and he said, "Why do you do that?" I told him it was because I liked doing it. His reply – "That's what old persons do." Obviously it was my day to be humbled on all fronts! 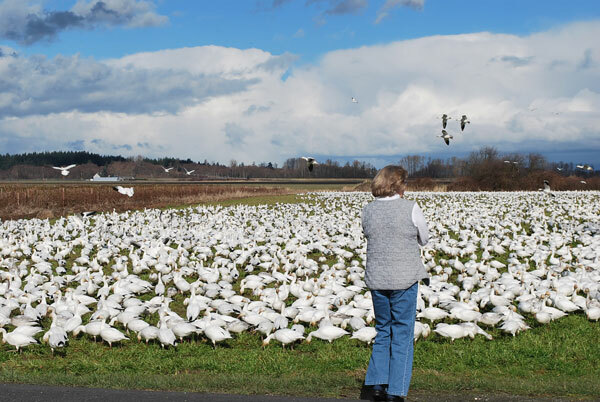 On the way down, we encountered migrating snow geese. These are such a magnificent sight every year, along with the trumpeter swans that stop by for a visit. I can't remember if I mentioned that our knitting group is doing the Advent Scarf as a year long project. The goal will be to do two patterns a month. A couple of us who are experienced lace knitters are trying to stay a couple of patterns ahead so we can help out with any questions or problems. So far I am up to pattern #6. I've also been chugging along on In Dreams. Man, there are a lot of beads on this thing. It's already starting to get a little heavy. It's slow going and I have to be careful of dropping stitches. I'm using Knit Picks Shimmer, an alpaca, silk blend. 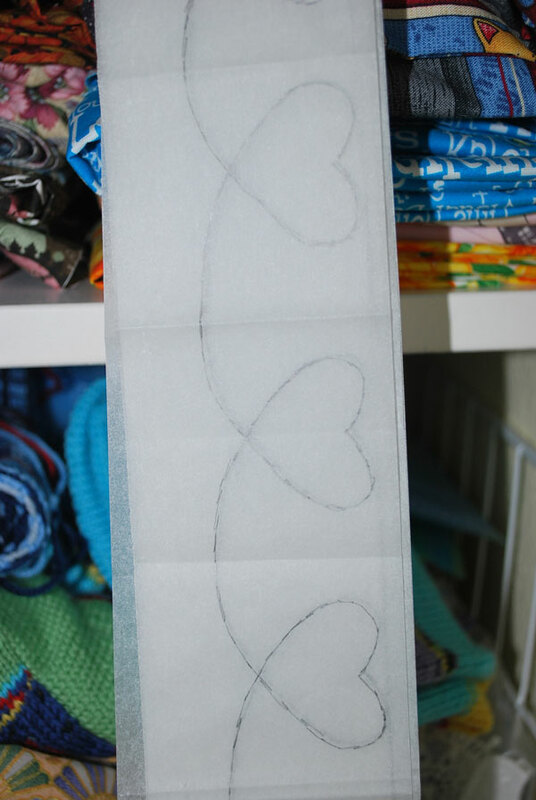 If you drop a stitch it immediately makes a break for it and slithers down several rows. With all the yarn overs and decreases, that can be a bear to try and pick back up. I've already had to tink back a few rows. I still stubbornly refuse to put in lifelines. I think they take up as much time (or more) than tinking and would have to be put in fairly often to do any good – at least for me. We're probably facing at least one more day at home and I'm really looking forward to spending it in my sewing room. I'll be working on an American Hero quilt for wounded Iraq soldiers and possibly an in-the-hoop project on my embroidery module. Good times! I have so enjoyed working on these quilts, but it's always nice to see the wrap up (literally) of a project of this magnitude. 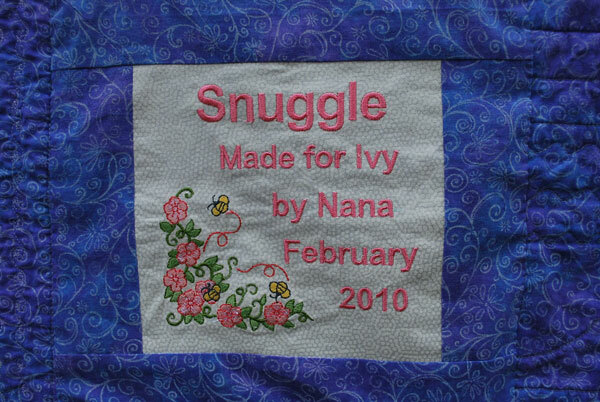 Some people would say there's an awful lot of work in quilts that are (with any luck!) going to be loved, washed, dragged around the house and generally used to tatters. But I enjoyed doing it and I know the girls are going to love them. In fact, Ivy felt the love before they were even done. 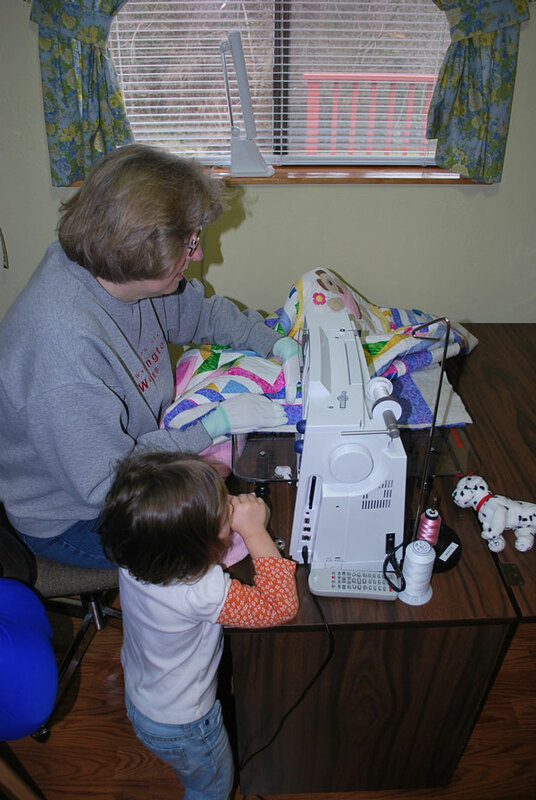 Every time she saw the quilts in progress, she would ask, "Is that quilt for me?" They stayed at our house this weekend while their house was being painted and she stood right by the sewing machine while I sewed and kept asking, "Is it done yet? Is it done yet?" She really didn't care that the quilting wasn't done and the binding wasn't sewn on. 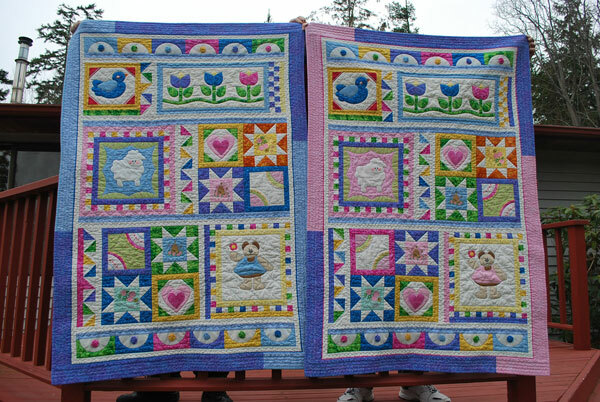 The observant among you may notice that I did not free motion quilt the borders. In the end I wimped out and did three rows of decorative machine stitching. About 1/3 of the way through, I realized I could have gotten away with only one row, but by then I was committed. I think I need a lot more practice free motioning before I'm ready to put it on a quilt that I really care about. As I was sewing on the labels, I realized that I had put in the WRONG YEAR! Doh!! However, I am NOT doing them over. We are just going to chalk it up to a senior moment for Nana and move on! 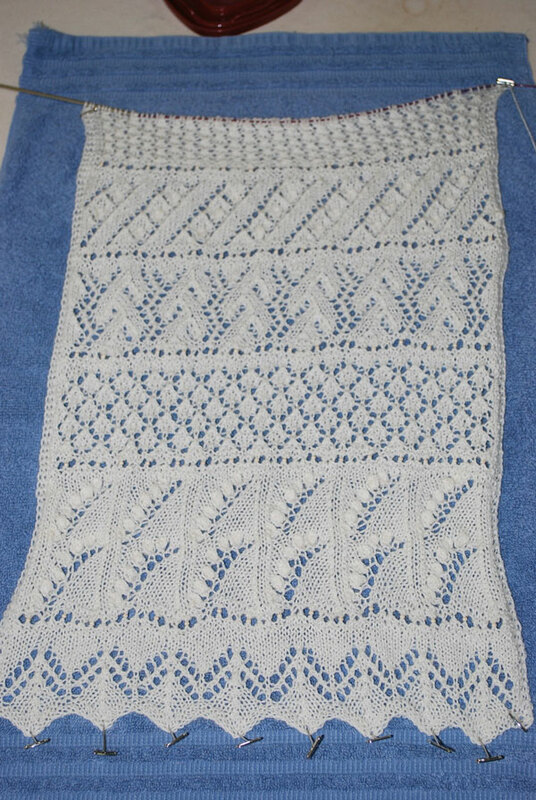 After doing the Evenstar KAL, I said that I would not do another. However, I have caved and joined the "In Dreams" KAL. I'm hoping there won't be quite as much drama with this one and I do so love her designs. And I certainly don't have to "join" in the discussions (which I probably won't). 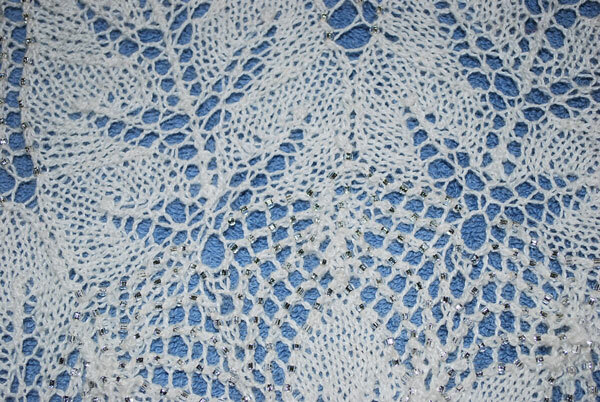 I'm still waiting for my yarn – Knit Picks Shimmer in white, but I got my beads yesterday – 5,000 of them! Off to start stringing them on dental floss. Far be it from me to complain about our weather, especially considering what the rest of the country is experiencing. I think we must be the only region that is not having extreme weather. However, we have had days and days (and days) of gloomy rain – not unusual winter weather for us. It was absolutely glorious when we experienced the sun for a few days this week. I was going to get out and get some pictures, but got side tracked by other things, so you'll have to take my word for it. It's a good thing I'm going to have a couple of FO's, because I have a serious case of "startitis". I've found at least four or five projects I could cast on today, but I'm trying to be disciplined. 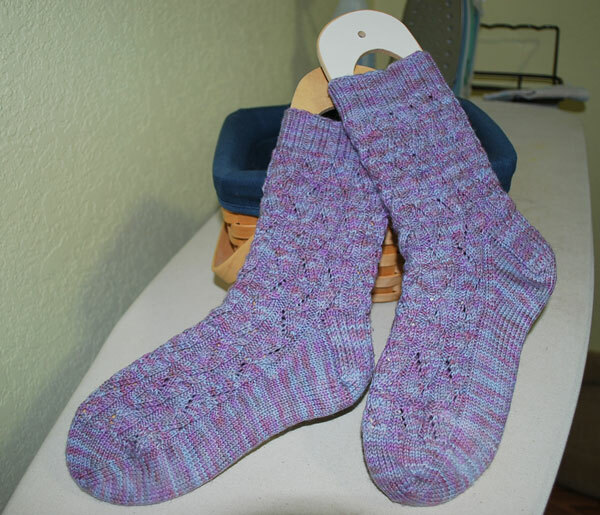 On the finishing block were the Sunshine socks I was making for myself – they've already been washed and worn twice. I love them! 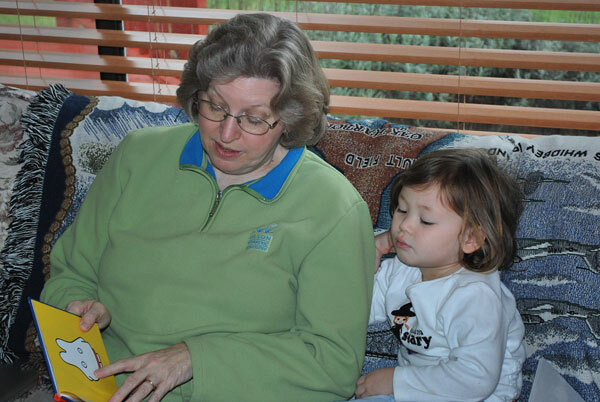 And, of course, one can never get tired of hearing, "Nana, will you read me a story?"